Guys, I think today's Skull Panda comic is particularly good. Just sayin'. 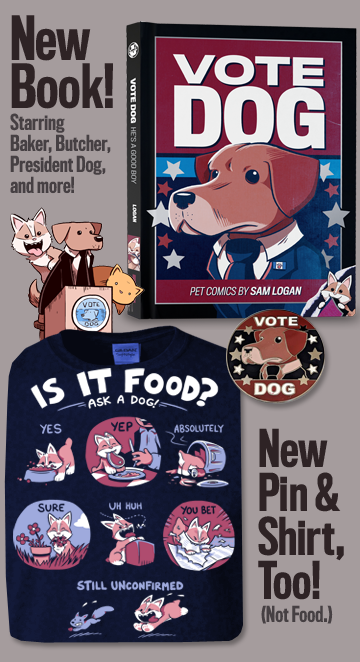 I think we've got some pretty great Sam and Fuzzy comics in the pipe for this week, too! I certainly got to draw a lot of things I never previously imagined trying to draw. Like a fight sequence where no one involved has arms. Intense! I haven't decided yet! There is definitely an art to picking a theme for these. f I make it too specific, it's hard for people to come up with enough unique variations to give as suggestions. So as fascinating as "everyone as fruit", "everyone as dinosaurs" or "everyone as nudists" might be for the first couple of drawings, I think the conceptual well would run dry pretty quickly. Surprisingly, I have to make sure not to make the theme too open, either! As I've learned at conventions, asking people for "any idea at all" often results in a lot of crippling indecision and/or blank drawing. And alas, some of the people who do come up with ideas often go a little off the rails, suggesting things that are way too complex or just plain esoteric. A good theme gets everyone in the right ballpark and stimulates cool ideas that they might not have thought of otherwise! I do think for now I'll keep the sketch-offs tied to drawings of Sam and Fuzzy characters specifically. I'm certainly not opposed to drawing other things -- and often do just that for regular commissions -- but those things also require a lot more prep, and more time to create. Sam and Fuzzy characters are something I can draw quickly, which makes them perfect for the Sketch-Offs... it means I can draw a lot of different people's suggestions, and also keep the prices for the originals low. 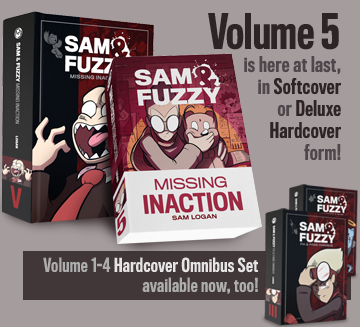 So invariably, good themes are one that provide lots of different potential scenarios, environments or costumes to stick the Sam and Fuzzy characters in. Historical figures may well fit that bill, but I worry that only a few famous historical figures are really VISUALLY iconic, aside from their faces (which I would not actually be drawing). I also forsee having to google and replicate a lot of very specific uniforms. Ha! Uh... maybe? You forgot to mention what you think he's suggesting! Was it Fig Pig? Be honest. No cheating and saying you thought it was Fig Pig if what you were really thinking was, I don't know... giant fish bait. Or Daniel Boone. For awhile there, in the midst of spring con madness, I didn't have enough free time to play anything! But now that things have calmed a little, I've decided to finally go back and continue Ratchet and Clank Future: Tools of Destruction. It's been sitting on my "finish playing this" shelf -- judging by my save file date -- since October of 2009. Uh, whoops! Anyhow, that's a wrap for this week, team! See you on Monday.